Save Yourself Time by Shopping Online! Start planning your garden any time of the year. 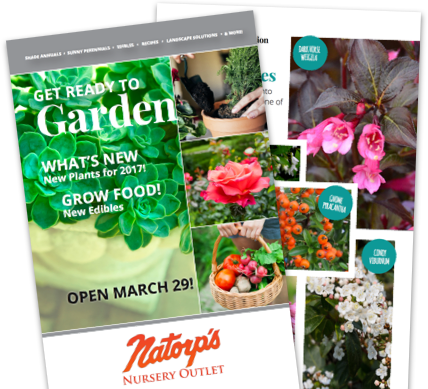 Find your perfect plants, pay online, and pick up at Natorp's Nursery Outlet. *** It may take up to 48 hours for orders to be processed and ready for pick up. Local delivery is available for orders over $300 for an additional fee. Shop Now! Need a Replacement? Need an Account? We work hard to ensure that the availability quantities displayed are as accurate as possible but our inventory changes daily as plants are sold and new crops become available. Some plants, like annuals and edibles, are also only available seasonally. Need to replace a plant that is still under our guarantee? It’s Simple. Email: questions@natorp.com or Call: 513-398-4769 ext. 1 and we will be happy to take care of you. Please note: Replacements cannot be done online. Visit Natorp's Nursery Outlet and experience 1 million plants in one location! Open to the public in the spring and fall. Spring is for Planting! Here are 100 Favorites for the Garden.